President Richard Nixon would call it "the greatest natural disaster in the history of the United States." 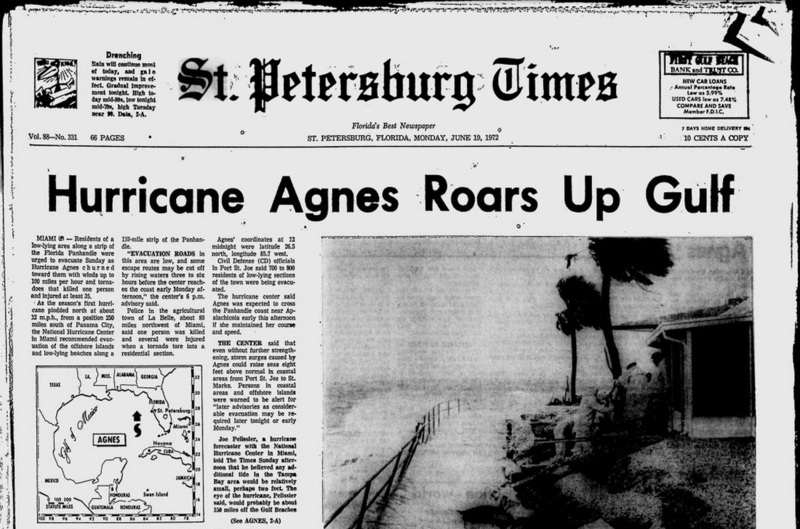 Hurricane Agnes made landfall in the Panhandle on June 19, 1972, bringing seven-foot tides to Cedar Key and submerging six bridges to the mainland. At Alligator Point, 16 homes were swept off their foundations. Tornadoes spawned by the storm destroyed 50 mobile homes and a fishing camp and caused six deaths in Okeechobee. 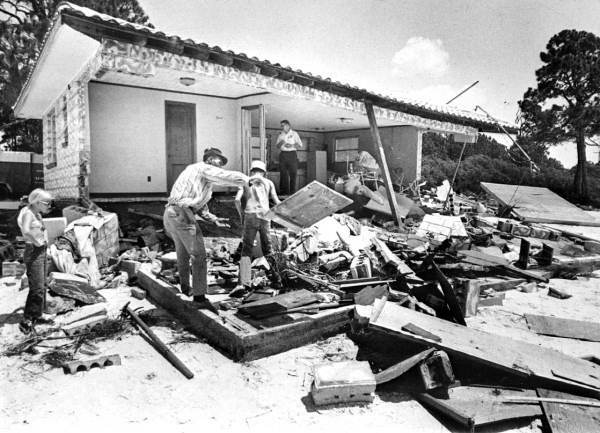 Twenty homes and 44 airplanes were destroyed in Cape Canaveral. Overall, the storm caused nine deaths and $39 million in damage in Florida. But the impact in Florida was minimal compared to what Agnes did as it plowed north, restrengthening after moving east into the Atlantic Ocean, then dumping severe rain on the East Coast. In Virginia, four people drowned after their car plunged into James River. In Maryland, three children died when their mother's car was swept off a highway. In Pennsylvania, more than 100,000 were forced to leave their homes because of flooding. At an historic cemetery in Fort Fort, Pa., 2,000 caskets were washed away, leaving body parts on porches, roofs and in basements. Some buildings in Harrisburg were under 13 feet of water. Helicopters were used to evacuate more than 100 YMCA campers in Harrisburg. Flooding was also severe in New York, West Virginia and Ohio. Overall, 15 states and the District of Columbia were affected. Agnes damaged 110,000 homes and destroyed 3,351. In the U.S. as a whole, 119 people died and damages were estimated at $3 billion. Today, Agnes ranks as the 10th costliest hurricane in U.S. history, behind seven that hit during the 2000s, plus 1989's Hugo and 1992's Andrew.